Fuel your fiery feminine side with the Wild Words from Wild Women 2019 Day-to-Day Calendar. 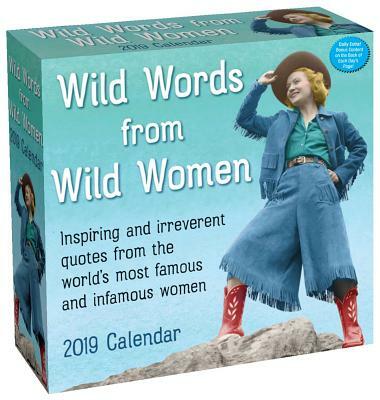 Featuring quotes from some of the world's most noteworthy and notorious women on topics such as aging, success, relationships, fashion, and more, this calendar will make all wild women proud. "I am no longer accepting the things I cannot change . . . I'm changing the things I cannot accept." "I went home with this French guy ’cause he said something adorable like, 'I have an apartment.'" "The best things in life are free and the second best are very expensive." Autumn Stephens is the author of several books in the Wild Women series and editor of two anthologies of women's first-person essays, The Secret Lives of Lawfully Wedded Wives and Roar Softly and Carry a Great Lipstick. Her essays and reporting have appeared in The New York Times, the San Francisco Chronicle, and numerous other publications. Autumn teaches private writing classes and workshops in the San Francisco Bay Area, and her passions include solving the world's problems over coffee and reading in bed. She agrees with Lily Tomlin that "things are going to get a lot worse before they get worse."